Dance the Distance is a concept class devised by the Exercise Movement and Dance Partnership that brings together popular styles of dancing such as Bollywood, street dance, line dancing and even the Can-Can. 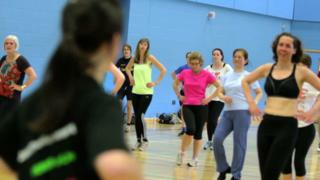 Just one Dance the Distance class has the equivalent steps and calories as a 5km run, so get dancing! For anyone who likes moving to a beat, dancing is for you. It's a fun and sociable way of keeping active and with so many styles out there, there is something to suit everyone, whatever your taste or aspiration. If you have been inspired to get into dance, take a look at our guide and find a style for you.